Besides comparing colleges based on their size and academic programs, high school graduates need to consider whether they’ll take advantage of in-state scholarships and grants or enroll in an out-of-state school. After, all some states do a better job of providing students with a high quality education. Wondering how your state’s public colleges compare to schools across the country? Take a look at our ranking of the best states for higher education. This is the third annual edition of this study. Read the 2016 study here. Our study compares four-year public colleges and universities in each state using multiple metrics, including the undergraduate graduation rate, the average net price, the 20-year return on investment and the student-faculty ratio. All of these factors are averages weighted based on each school’s total undergraduate enrollment. This means that larger schools have a greater impact on the overall average in every state. We also calculated the in-state attendance rate to assess whether states can effectively educate their own residents. In the end, we gave each state a grade. The top 15% of states received an A or A- and the bottom 15% received an F. To learn more about how we completed our analysis, read the full methodology below. Virginia is No. 1. 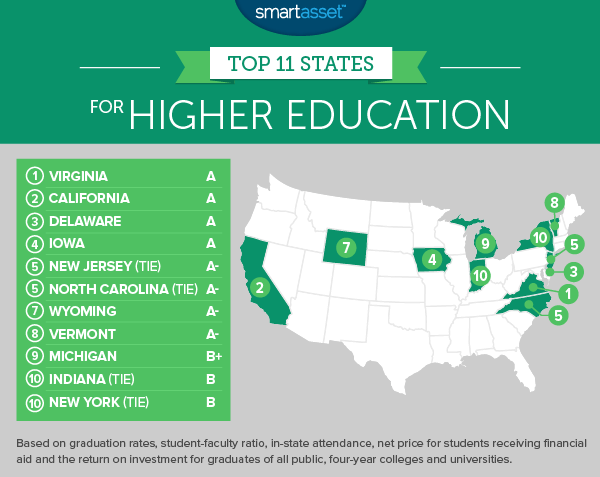 Each time we look at the best states for higher education, Virginia appears in the top 10. It ranked second in both the 2015 and 2016 edition of our analysis. But this year, Virginia took the top spot. Two-way ties. New Jersey and North Carolina received the same raw score in our ranking. Both states tied for fifth place. So did Indiana and New York, which tied for 10th place. Nevada is No. 50. The student-faculty ratio for colleges in the Silver State is higher than average. Plus, the average graduation rate is low. Georgia, Maine and Idaho are some of the other states that ranked poorly. Virginia is the top state for a higher education in 2017. The state effectively educates its students. It has one of the highest average graduation rates in our study (70%). And the average 20-year return on investment for graduates is $442,660. That’s the fourth-highest ROI in our study. For 2017, both the University of Virginia and the College of William & Mary rank among the top 10 public universities in the nation, according to U.S. News & World Report. California consistently ranks as one of the top states for higher education. But since last year, it has slipped from the top spot in our study. However it still rates well for a number of reasons. For example, the state’s average graduation rate is 63%. That’s the eighth-highest in the country. Plus, the state of California has the second-highest return on investment in the U.S. Graduates earn an average ROI of $459,656 over the course of 20 years. For the third year in a row, Delaware ranks as the state with the highest average graduation rate in the country. About 73% of the state’s students who attend a public university earn a bachelor’s degree. At 79%, the University of Delaware’s graduation rate is slightly higher than the state’s weighted rate. Over the course of 20 years, the average return on investment for Delaware State University and UD alumni is roughly $434,034. 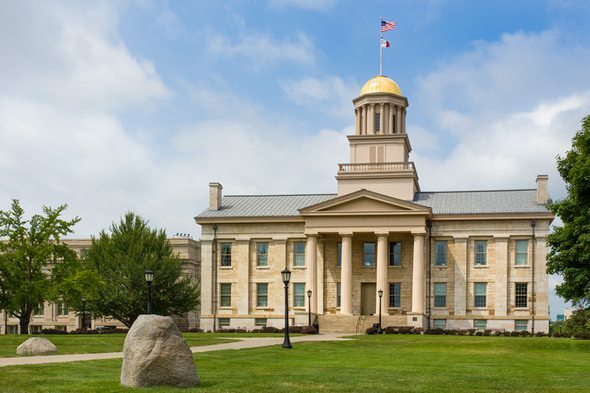 What makes Iowa one of the best states for higher education? For one thing, the average graduation rate across its public colleges and universities is 68.6%. That’s the third-highest graduation rate in the nation. The 20-year ROI for graduates of schools like Iowa State University and the University of Iowa is $387,049. Across all public colleges and universities in the Garden State, the average graduation rate is 66%, which is the fourth-highest rate in the U.S. There are nearly 16 students for every faculty member and the average 20-year return on investment for graduates of New Jersey’s higher education system is $394,232. That’s the 10th-highest ROI in the country. Nearly 65,600 high school students in North Carolina enrolled in one of the state’s public two- or four-year universities in 2014. So the number of first-time, in-state students is equal to 65% of the state’s 2014 high school graduates. This means that North Carolina has the ninth-highest in-state attendance rate in the U.S. In addition to doing a relatively good job of educating its own residents, public colleges and universities in the Tar Heel State are relatively affordable. Across its many four-year schools, the average net price for the 2014-2015 school year was just $11,239, according to the IPEDS data center at the National Center for Education Statistics. The Cowboy State is home to the University of Wyoming. Compared to other flagship universities, UW is fairly small. During the 2015-2016 school year, only about 10,045 students were enrolled in the university. But whatever the school lacks in size, it makes up for with the quality of education that it offers its students. The student-faculty ratio at UW is 14:1 and graduates get an average return on investment of $442,000 within a 20-year time span, according to Payscale. That’s the fifth-highest ROI in the nation and it’s 15.3% higher than what we found in the 2016 edition of our analysis. Vermont ranks as the eighth-best state for higher education. College classes are typically small compared to the national average. IPEDS data reveals that Vermont’s student-faculty ratio is just under 14:1. The weighted graduation rate in the state is 65% and the average 20-year return on investment across schools like the University of Vermont is $389,000. Michigan has more than a dozen public colleges and universities, including the University of Michigan. The school’s campus located in Ann Arbor ranks fourth in the 2017 edition of the U.S. News & World Report’s list of the best public colleges and universities. Ann Arbor also ranks as one of the best college towns, according to the most recent edition of our study. In terms of its average graduation rate and return on investment, Michigan falls near the middle of the pack. The weighted graduation rate across all of its public colleges is 54% and the 20-year ROI for graduates is around $351,158. But the in-state attendance rate is the 12th-highest rate in the country. This year, Indiana makes its debut appearance on our list of the best states for higher education. Its low net price helped it rank well. The average net price for undergraduate students across Indiana’s four-year public institutions was just $11,110 for the 2014-2015 school year. The state’s weighted graduation rate is 49% and the 20-year return on investment is $341,347. For students who live in New York, staying in-state for college could be worth considering. Although New York City has a high cost of living and high tax rates, attending college in the Empire State doesn’t have to be an expensive endeavor. The average net price for students attending four-year public schools was $11,689 for the 2014-2015 school year. That’s the 13th lowest in the country. Undergraduate graduation rate. This factor comes from the Integrated Postsecondary Education Data System (IPEDS), which collects data for the National Center for Education Statistics. This data was gathered during the 2015-2016 school year but is for students who graduated prior to that year. This is the most recent data that is available. Average net price. This metric considers the average yearly price for first-time, full-time undergraduate students. It provides a snapshot of what students have to pay to attend college after subtracting financial aid from the total cost of attendance. It comes from the IPEDS data center and it’s from the 2014-2015 school year (the most recent dataset). Student-faculty ratio. This metric also comes from the IPEDS data center. It’s from the 2015-2016 school year. 20-year return on investment. This factor comes from Payscale and is the most recent data available. Our averages were weighted using the total undergraduate enrollment at each school. Then, we found the in-state attendance rate in each state using data from the Western Interstate Commission for Higher Education. The in-state attendance rate reflects the number of first-time, in-state students in each state in 2014 as a percentage of the total number of students who graduated from high school in 2014. We used 2014 data because the 2015 dataset was incomplete. Note that we also used data for two-year and four-year public colleges. Some students attend community colleges with the intention of transferring to four-year schools. To complete our study, we ranked all 50 states across all five of our factors. Then we averaged our rankings, giving double-weight to the graduation rate and full weight to the other metrics. Then we assigned each state a grade on a curve. The top 15% of states received an A or A- and the bottom 15% received an F.